What in the HELL. We're all sick with another cold. I just can't even. My child does not sleep if he can't breathe through his nose (which he cannot). Also every time he sneezes mass amounts of snot comes flying out. So much. So many. His head is so tiny... where is it all coming from? Oh hey, it's our three yeah anniversary today, my boyfriend and mine. We're celebrating by being sick. We're gonna do something fancy over the weekend doe. Oh hey again, I won nail the Mother's Day Duo from Daphine Polish in a giveaway at Colorsutraa! I don't win things, like, ever. It was all Rafflecoptery and things! "Lullaby is a glitter topper with light pink, light blue, lavender, violet, and mint matte glitters, iridescent glitters, light pink matte butterflies, and light blue matte hearts, all packed into a multi-colored shimmer base. 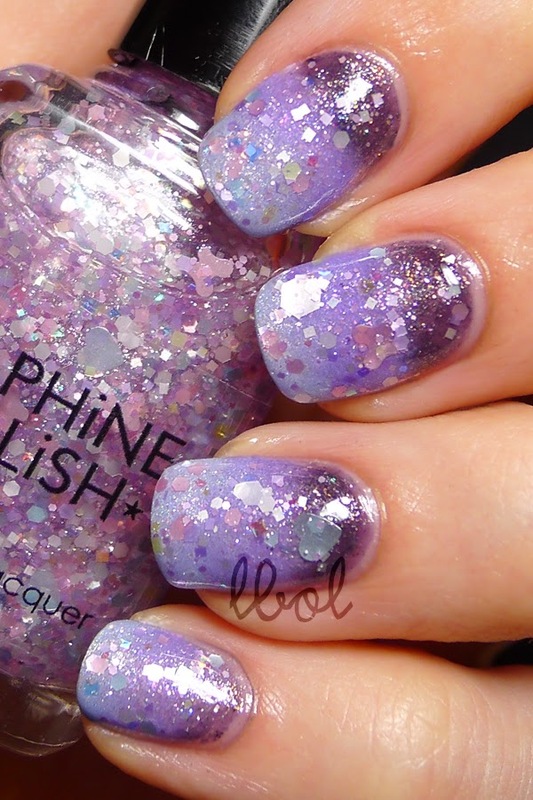 ...and Goodnight is a darkened royal purple polish with dark grey micro flake and gold shimmer." 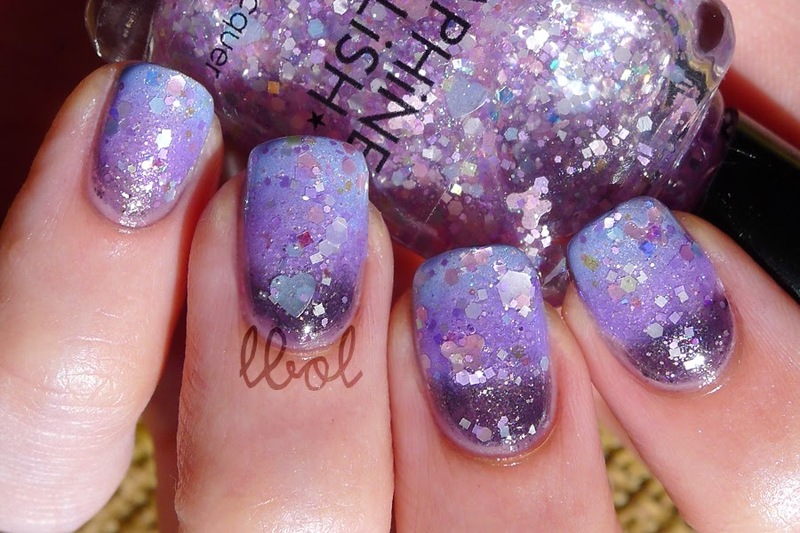 I decided to layer Lullaby over a gradient consisting of ...and Goodnight, Essence - Oh My Glitter! & Enchanted Polish - April 2014 because I don't do glitter toppers often so I wanted to make this'n special. I won a thing!!!!! Ayeeyeeyeeyee!!!! and so on. The first picture was taken in direct sunlight while the second was taken under OttLite, showing two coats of Lullaby. Spring-y and adorable, right? I had to do quite a bit of fishing for the larger shaped glitter but I'm not complaining! I'm completely happy with my winningsss. This was my first frolic in the meadow that is Daphine Polish aaand I'm certain it won't be my last with how lovely this duo is. Line dancing rodents! (You know - conga-rats? LOL) on winning your polish. It's pretty and I like it over the gradient. Sorry to hear you're all sick. The snots are horrid with little ones. I'm.. it took me like three tries to get that first sentence, bahaha. I got the email and I was like, wait, what? I.. what? I found a way to get the baby to sleep for three hour stretches at night, so we're on the up and up! I've only been a tissue twice today so far. No way, dude. Nothing to do with your cleverness, all to do with my snot/sleepless brain.